It’s all about FUN. This intense competition over rugged terrain will be sure to serve up some of the most exciting running of the year. The course is designed to be fun and doable for everyone. You’ll finish with a smile on your face and feeling like a champion! Whether you’re running or just a fan that shows up to witness the best racing running has to offer be sure to stay for Runner Carnival. Kids will also enjoy Runner Carnival as there will be blow up toys, food, drinks, prizes, and lots of entertainment for everyone. 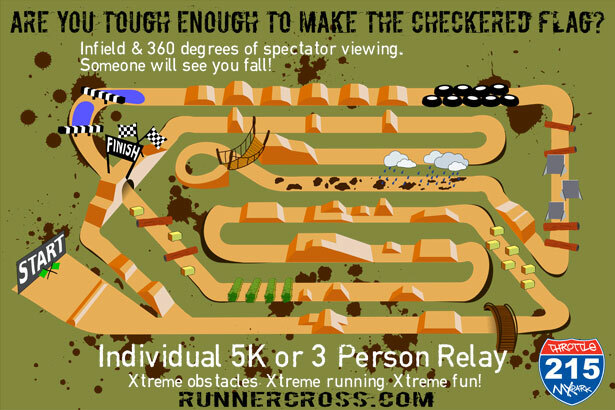 Come check out the new vibe, and all the action, and register to flat out race to be the fastest runner or team to the finish. Grab two other friends and get ready for fast hand-offs, screaming, yelling, taunting and probably some friendly competitive bumping as your team does 6 laps. Each runner completes 1 lap and hands-off to one of his/her teammates. This means lots of handoffs! They then have a chance to catch their breath, cheer their teammates on, and strategize before getting ready for their 2nd hand-off and lap around the track! Run it by yourself or bring a bunch of buds and run it all together as a team! You get to experience the starting gate, the checkered flag, and three fun-filled nonstop laps. Don’t feel bad if you have to take a pit stop. This 5K is intense! But that’s what you expect, you want to prove yourself and that’s why you want to do it alone! A thrilling offroad footrace held on a super sweet multi-loop track infused with eye popping obstacles , mud, water, and super fun twists and turns. All entry fee payments are final and non-refundable.